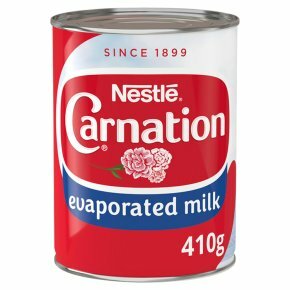 Evaporated milk fortified with Vitamin D.
Each can contains 410g of Carnation® Evaporated Milk. Creamy, delicious evaporated milk. A great versatile topping for all your favourite desserts. Made using fresh milk - rich in calcium and vitamin D. Suitable for vegetarians. Carnation® Evaporated Milk is a delightfully creamy classic topping for all your favourite desserts, from a fresh fruit salad to a sticky toffee pudding. In fact, it's so versatile that it makes a great ingredient for baking, too - like in our delicious Broccoli and Stilton Quiche! Made from fresh milk, it's a great-tasting source of calcium and has added Vitamin D. Carnation® Evaporated Milk in coffee or tea is a creamy treat, too. Why not give it a try?